Home Entertainment Tiwa Savage and Wizkid plan new collabo; singles set to drop. Following the huge success of ‘Ma Lo’, and their decision to remain best friends off and on the stage, singers Wizkid and Tiwa Savage have revealed plans to release another joint single. Wizkid took to his Twitter handle recently to reveal that he would be collaborating with Tiwa Savage in a new song. Wizkid and Tiwa Savage recently hinted that they have a new single on the way, but more than one song, we think it is high time Nigerian artists serve us joint albums. 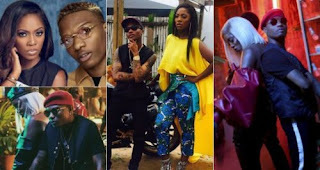 In a tweet posted on Monday, June 18, Wizkid alongside Tiwa Savage announced that a new single is expected to be released anytime soon and this has gotten a number of their fans really excited. Their fans are, however, wondering if the besties this time would be dropping a club banger or a mushy love song like what they have been displaying on stage. But amidst the excitement, a fan tweeted at the StarBoy asking for more, instead of just one song, why not an album?